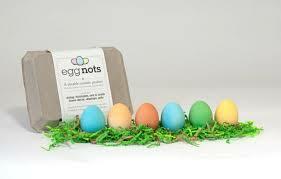 I know about EggNots, but have never tried them, have you? I would love to hear any ideas you may have tried out or seen! Vegan Easter is a page for recipes, photos, shopping ideas and all things Easter-related that are suitable for vegans! Ellison Darling I’ve seen two pretty cute suggestions for “eggs” on this holiday. One was to dye or paint wooden eggs from a craft store. I’ll see if I can find a link to the other idea. It’s a little more complicated than the first one. Claudine Kelly Herlihy We are coloring wooden eggs. Maria French What kid (vegan or not) wouldn’t enjoy hunting paper mache eggs filled with candy more than boiled chicken eggs?